I'm on a roll today with the computer so I figure I'll just keep going until my eyeballs fall out of my head. Edit edit edit...upload 9 bajillion photos to Flikr and Facebook...edit some more...label...tag...organize...someone pour me a beer stat! This was one of the desserts served at the June TK dinner - in addition to Florentines and Lemon curd filled thumbprint cookies - I know...I'm nuts for making all those treats. But this little dish just HAD to make an appearance because it is delicious! 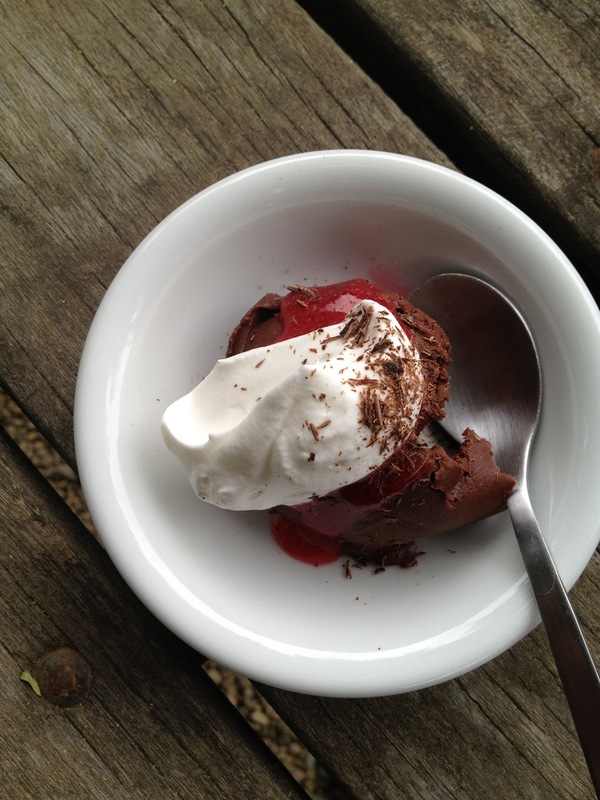 I served it with a raspberry coulis, fresh berries, cream and chocolate shavings. All gone. From the July issue of Food and Wine magazine. If you love chocolate this is the dessert for you. chop the chocolate - place into a good sized heatproof bowl - set aside. medium saucepan - add the heavy cream and whole milk - bring to a simmer over medium heat. in a bowl whisk the egg yolks and sugar and salt until creamy. add very little of the hot cream to the egg mixture whisking continuously. gradually add the hot mixture to the egg mixture until it is all incorporated. everything back into the saucepan and back onto the stove - medium low heat. pour the custard over the chopped chocolate. let stand until chocolate is melted - just a couple of minutes. whisk the cremeux vigorously until smooth. pour into a shallow glass or ceramic dish. press plastic wrap directly onto the surface and refrigerate until set - overnight is best. 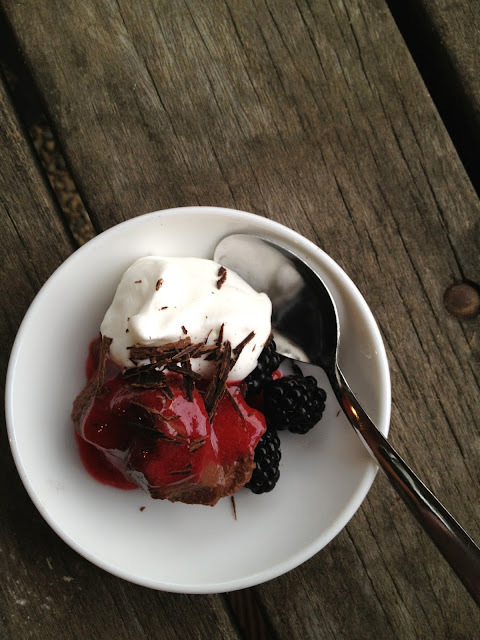 when ready - spoon into bowls - add a dollop of cream - add chocolate shavings - berries - serve. I always read food blogs at night and get the nighttime munchies....this post did not help with that problem. Looks wonderful. LOL - thank you Sarah..